Searching on Newegg for "raspberry pi", the results included many heatsinks and as well as a few other types of cooling systems, yet these items do not seem to appear when looking through the stores of the official distributors. Does the Raspberry Pi need some sort of cooling system for its processor such as a heatsink? If one is not always required, are there special situations where a cooling system would be necessary (operating in an outdoor environment where temperatures may reach 35°C during the day)? Or is the temperature more related to how hard the processor is working? Do home-made cases for the Raspberry Pi need to include some sort of ventilation or fan to avoid temperature buildups? note that from the picture, the main component that gets hot is the USB/ethernet hub - by far, this MAY warrant a heatsink if you are using those components heavily, it has restricted airflow due to a case/etc. and it is in a warmer environment, or some combination thereof. The second component that gets warm in the image is the 3.3v regulator - this is to be expected from a linear regulator, and basically a non-issue in the new + editions of the pi. These pieces are designed to heat up (that is how they work), so I would not be concerned with this piece needing a heatsink. No. The chip used in the Raspberry Pi is equivalent to a chip used in a cellphone, and does not become hot enough to need any special cooling. No, it does not need a cooling system. If the CPU gets too hot (>85C) it will throttle back the speed. Perhaps vendors sell heat-sinks to gullible people for the same reason they sell gold plated digital audio cables, they make a profit. There are tests videos on YouTube. Here is one with heatsink and one with an additional fan. It's clear that the heatsink alone does only make a marginal difference, which probably does not justify the money you pay for a heatsink. Sure it doesn't help much, but they are typically only a few dollars and look nice so why not? 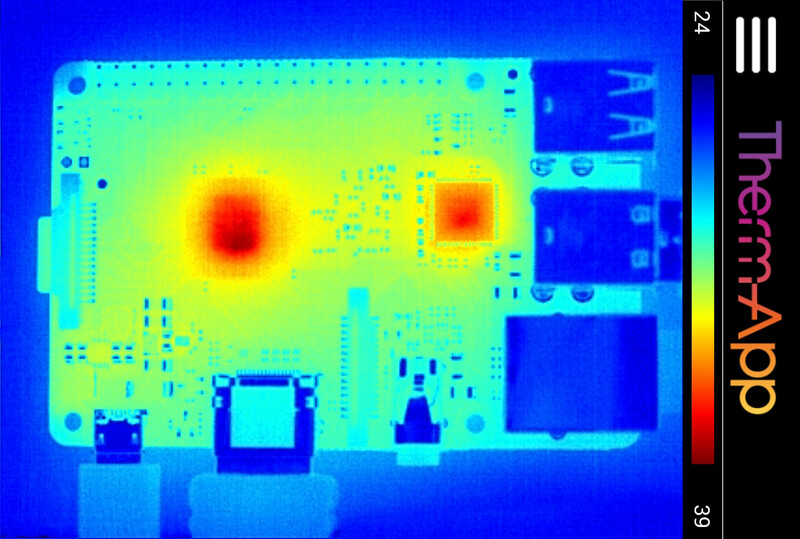 http://www.rootusers.com/raspberry-pi-heat-sinks-temperature-before-and-after/ temperatures do drop a bit, yes it's a cheap device so this isn't exactly critical. The best thing I can suggest is just to monitor the temps for a while and see for yourself if it is needed in your case. (ambient temps, overclocking and continued load being major factors). The greater the load on the components, the more heat they produce. If you are overclocking it then yes, you might need to provide extra cooling. However if you do decide to push it a bit it is advisable you provide extra cooling. What cooling is the most effective for the RPi 3B+? Does the Raspberry Pi have Hardware Floating Point support? How do I control the system LEDs using my software? Does the Raspberry Pi manage hardware interrupts? How much current does the Raspberry Pi can handle? Does the Logitech MK235 work with a Raspberry Pi 3?